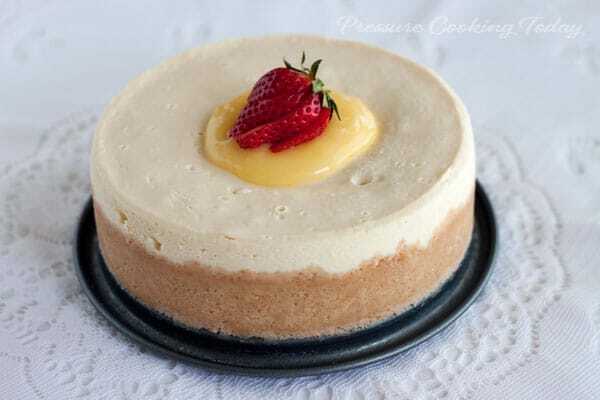 Meyer lemon cheesecake is the best pressure cooker cheesecake recipe for a summer dessert or as a Valentine’s Day sweet treat! 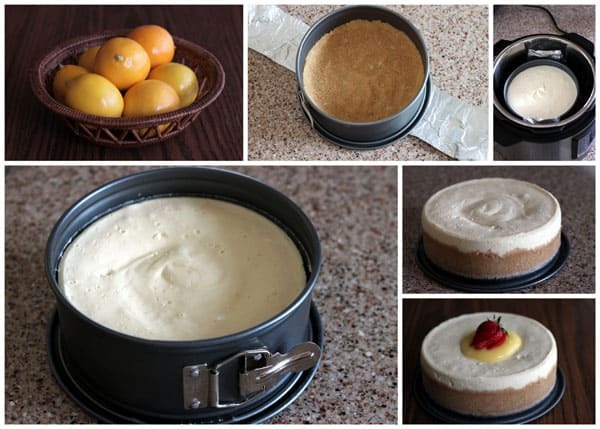 A rich, creamy Meyer lemon cheesecake “baked” in a Insta Pot in just 15 minutes. Top it with a little tart lemon curd to add a little sunshine to your day. For Valentine’s Day, I thought it would be fun to make dessert in the pressure cooker. I’ve been dreaming of whipping up bread puddings, steam puddings, and lava cakes in the pressure cooker. But when I saw the gorgeous pressure cooker cheesecake recipe that Sally, from A Food Centric Life, posted, I decided that would be perfect to share for Valentine’s Day. An Instant Pot is one of the most popular brands of electric pressure cookers. They are easy to use and your Instant Pot can help you create this delicious Meyer Lemon Cheesecake! I used my own cheesecake recipe which includes sour cream for a creamier cheesecake. I did however, follow Sally’s suggestions to use a foil sling to help make removing the cheesecake from the pressure cooker easier, and her advice not to cover the cheesecake with foil while it cooks. She’s tried it both ways and prefers the result without the foil cover. Sally adapted her recipe from Pressure Perfect by Lorna Sass. Instead of graham crackers, I used shortbread cookies for the crust. I served the cheesecake with homemade Meyer lemon curd. I made my favorite lemon curd recipe, but you can also buy delicious lemon curd at the grocery store. It would also be fantastic with a sweet berry compote. My husband asked me why I was making cheesecake in a pressure cooker. I told him because it was fun. But now that I’ve made and devoured it, I realize there’s so many reasons. It’s quick; the moisture creates a super creamy cheesecake that cooks very evenly; it doesn’t crack; and you don’t have to worry about water from your water bath leaking into your crust. that will fit into your pressure cooker. As it turns out, the 7″ size is a great size for cheesecake. A big 9″ cheesecake is too big unless you’re having company. The leftover pieces sit in the fridge and taunt me until I’ve eaten more than I should. The 7″ size is just right. This luscious dessert is perfect for Valentine’s Day, but a little 7″ Meyer lemon cheesecake is a perfect way to make any night special. Before you get started, be sure and read my Making Perfect Pressure Cooker Cheesecake posts for additional tips. Prepare a foil sling for lifting the pan out of the pressure cooker by taking an 18” strip of foil and folding it twice lengthwise. Set aside. Crush cookies in a Ziploc bag in to fine crumbs. Add butter and toss until well combined. Use your fingers or the bottom of a drinking glass and press crumbs evenly/firmly into the bottom and half way up the sides of a 7" springform pan. Put pan in the freezer until ready to use. In a large mixing bowl, mix the cream cheese and sugar until smooth. Add sour cream, Meyer lemon juice, Meyer lemon zest, and vanilla and blend until combined. Add in eggs one at a time and mix just until combine. Do not overwork the batter. Pour batter into the springform pan on top of the crumbs. Pour 1 cup of water into the pressure cooker and place the trivet in the bottom. Carefully center the filled pan on the foil strip and lower it into the pressure cooker. Fold the foil strips down so that they do not interfere with closing the lid. Lock the lid in place. Select High Pressure and set the timer for 15 minutes for a soft creamy cheesecake or 25 minutes for a more firm, dense cheesecake. When beep sounds, turn off pressure cooker and use a natural pressure release for 10 minutes and then do a quick pressure release to release any remaining pressure. When valve drops carefully remove lid. Remove the pan to a wire rack to cool. If there is a little water on top blot with a paper towel. When cheesecake is completely cooled, refrigerate covered with plastic wrap for at least 4 hours or overnight. Substitute 3/4 cup graham-cracker crumbs (about 5 crackers), 3 tablespoons unsalted butter, melted, and 1 tablespoon sugar for a traditional graham cracker crust. 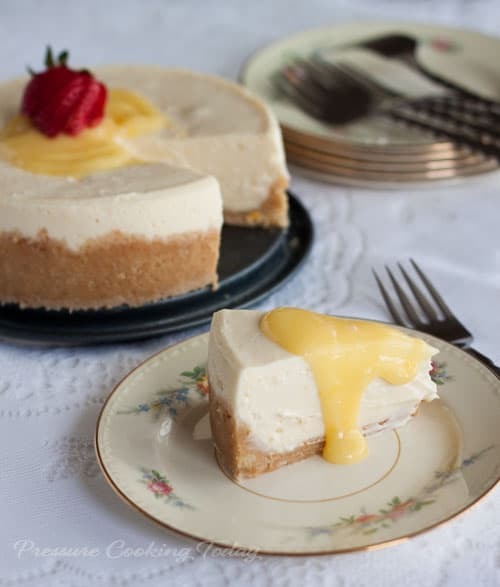 *If you prefer a traditional cheesecake, you can omit the lemon juice and zest and increase the vanilla to 1 teaspoon. Is there a way to make this lower carb? Maybe use Splenda instead of sugar, but how much? Hi there – first time trying this recipe and very excited! I only have a 9” pan. Should I leave the recipe as is? And what about cook time? Welcome! A 9-inch pan won’t fit in a 6-quart pressure cooker so unless you have a larger pressure cooker, you won’t be able to use your 9-inch pan. If you do have a larger pressure cooker, then you’ll need to double the ingredients and use a 35 minute cook time with a 10-minute natural pressure release. You wanted it to be 150 degrees in the center. I have made this cheesecake many times but I substitute lime juice and zest for the lemon and made a strawberry sauce for the topping. Got raves all around. Sounds like a delicious way to change it up. Thanks for sharing Beverly! This is probably the wrong place to ask this. My Pressure cooker was delivered last night. But can I use frozen chicken, berries and vegetables? My neighbor and I have the same question. Please help us. Hi Kathy – here’s my post on cooking frozen chicken https://www.pressurecookingtoday.com/how-to-pressure-cook-frozen-chicken-breasts/. You can use frozen berries https://www.pressurecookingtoday.com/pressure-cooker-blueberry-compote/ and frozen vegetables in a steamer basket over a cup or more of water. I used this recipe with the traditional graham cracker crust, no lemon juice and 1 tsp vanilla extract. It was my first try at and Instant Pot cheesecake and I was very pleasantly surprised how well it turned out! It is deliciously creamy and smooth. Please note, it does benefit greatly from being refrigerated for the full 8 hours or overnight to achieve a firm cheese cake. Will definitely be trying more of your cheesecake recipes! Thank you for sharing! Awesome – thanks for sharing Glinda! Chilling definitely makes a big difference in the texture. Have fun! Hi Barbara – I have made this several times and it’s fantastic! I was wondering if this could be made with key limes instead of Meyer lemons? Would there be any adjustment to the amount of sugar needed? Making it for July 4th! Hi Melinda – I haven’t tried it with limes, but I do have an easy Key Lime Pie recipe https://www.pressurecookingtoday.com/pressure-cooker-key-lime-pie/ that’s fabulous. I also have a Key Lime Cheesecake in my upcoming cookbook Instantly Sweet https://www.amazon.com/dp/1558329374/?ref=idea_lv_dp_ov_d, which is similar to the pie but with cream cheese added in. Since there’s only 1 tablespoon Meyer lemon juice in this recipe, you could substitute lime without adjusting the sugar. Made this for Easter dessert with a gingersnap crumb crust. I topped it with a layer of the lemon curd, which gave it an extra lemon punch as well as a beautiful finish. Well received! Thank you. I made the vanilla version of this cheesecake and it was so DELICIOUSLY CREAMY!!! Yum!!! Last night I made the lemon version but was not as creamy and had a slightly spongy texture. I’m wondering why. The second time I did use a silicone tray instead of the metal trivet. Would that be the factor to change the consistency like that? I would love any advice. Hi Janna – I have found the silicone seems to slow down the pressure cooking process and I do need a longer cook time when I use silicone. Maybe it just needed more time? Or, maybe it was just overmixed so it was a little spongy? Was your cream cheese at room temperature? I am a huge fan of Lemon and Blueberry. Could I add some whole blueberries into the cheesecake? Hi Melissa – I haven’t tried it, but I think it would work just fine. You may need a longer cook time, especially if your berries are very juicy. Is there a reason you don’t include 1 Tbsp flour in this recipe as with other cheesecake recipes? Hi Linda – the flour helps make a thicker, more dense cheesecake. This one is more light and creamy. You can make it more dense by cooking it longer as well. Look, I’m not about putting lemon in cheesecake…personally I thought that sounded like running a perfectly good cheesecake, but also, I’m in love so I made this for my boyfriend who loves lemons. I was absolutely not expecting this to be the best cheesecake I have ever made (and I have made great cheesecakes). I made it with the berry compote and it was hands-down the best cheesecake I have ever had. Ever. Is there a reason there would be water all over the top? Should I have covered it with foil in the pressure cooker? Hi Robin – I prefer not to cover my cheesecake with foil but you do end up with a little water on top. That’s no problem, just use the end of a paper towel to soak it up. Hi, This recipe looks amazing and I can’t wait to try it but can you provide a recipe for the ganache you put on top of it? Made Myer Lemon cake, after 35 min w 7 in springform was still mostly liquid??? Hi Mike – are you sure it came to pressure? Did you make any changes to the ingredients? How can I adjust the recipe and cooking time for 6″ pans? I love your recipes and have referred many friends to your site. Thanks! Thanks Allie! Always so nice to hear 🙂 I would use the longer cook time 25 minutes with the 6″ x 3″ pan otherwise, you shouldn’t need to make any changes. For a 6″ pan if I increase the time to 25 minutes I would get a creamy cheesecake, right? How long would I cook for a firm, dense cheesecake (still using a 6″ pan)? Another site says 37 minutes and 15 minutes NPR. What do you think? Hi Kristin – if you want it firmer, you could cook it for 30 to 35 minutes. If you’re covering it with foil, then use the longer cook time. Enjoy! Perfect timing–my Meyer lemon tree is loaded with lemons. This sounds like a perfect way to use some of them. Hi Mary – how wonderful to have a Meyer lemon tree in your yard. Enjoy! I have been looking at your recipes and would like to try them. I have a Power Pressure Cooker XL 8 quart. What cooker do you use and is there a converter list, if you use a different cooker? The instructions that came with my cooker is very lacking and the cook book is pathetic. I wish I could find a cookbook just for the PPC XL. The controls on the front confuse me. Would much rather just have a setting for time and temperature. Hi Gil – I did a post all about the Power Pressure Cooker XL http://www.pressurecookingtoday.com/how-to-use-the-power-pressure-cooker-xl/ that you’ll find really helpful. I’m sure as an old military cook you’ll be a pro soon. I just made this cheesecake with my pressure cooker. So far looks good but need to wait a few hours to let it settle so I can try it. Can’t wait!. I was wondering if I can use this recipe for my oven as well? If so, are there any changes to the recipe and what is the temperature/time I need to bake it for? Thank you! Great! Sure you can use this recipe in the oven. I would cook it similarly to this one http://www.barbarabakes.com/strawberry-cheesecake-with-an-oreo-cookie-crust/ – of course reduce the time if you’re only making a 7″ cheesecake in the oven, about 35 – 40 minutes probably.